Along with nitrogen, potassium fertilizer is applied to stimulate plant growth and metabolism. By measuring potassium content in vegetation researchers and farmers can estimate plants that are stressed by potassium deficiency and apply corrective measures. 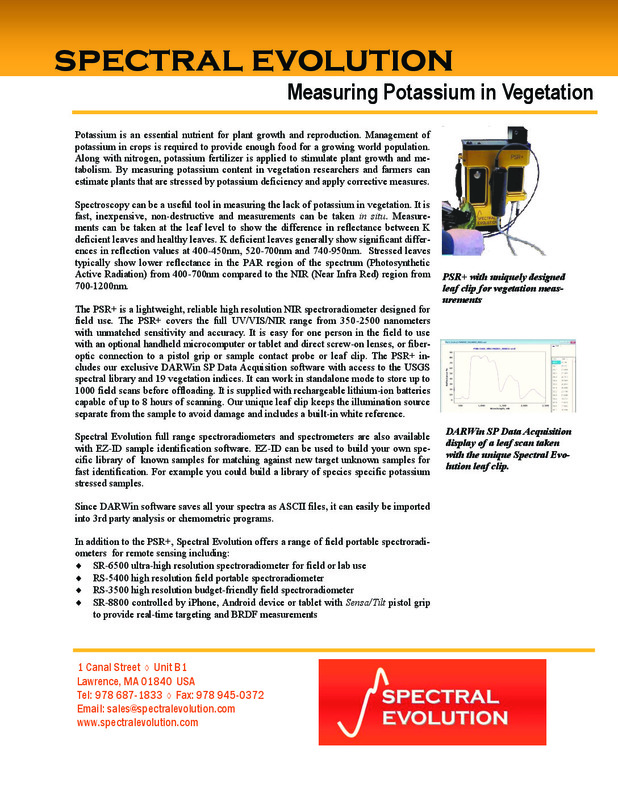 Spectroscopy can be a useful tool in measuring the lack of potassium in vegetation. It is fast, inexpensive, non-destructive and measurements can be taken in situ. Measurements can be taken at the leaf level to show the difference in reflectance between K deficient leaves and healthy leaves. K deficient leaves generally show significant differences in reflection values at 400-450nm, 520-700nm and 740-950nm. Stressed leaves typically show lower reflectance in the PAR region of the spectrum (Photosynthetic Active Radiation) from 400-700nm compared to the NIR (Near Infra Red) region from 700-1200nm. The PSR+ is a lightweight, reliable high resolution NIR spectroradiometer designed for field use. The PSR+ covers the full UV/VIS/NIR range from 350-2500 nanometers with unmatched sensitivity and accuracy. It is easy for one person in the field to use with an optional handheld microcomputer or tablet and direct screw-on lenses, or fiberoptic connection to a pistol grip or sample contact probe or leaf clip. The PSR+ includes our exclusive DARWin SP Data Acquisition software with access to the USGS spectral library and 19 vegetation indices. It can work in standalone mode to store up to 1000 field scans before offloading. It is supplied with rechargeable lithium-ion batteries capable of up to 8 hours of scanning. Our unique leaf clip keeps the illumination source separate from the sample to avoid damage and includes a built-in white reference. Spectral Evolution full range spectroradiometers and spectrometers are also available with EZ-ID sample identification software. EZ-ID can be used to build your own specific library of known samples for matching against new target unknown samples for fast identification. For example you could build a library of species specific potassium stressed samples. Since DARWin software saves all your spectra as ASCII files, it can easily be imported into 3rd party analysis or chemometric programs. 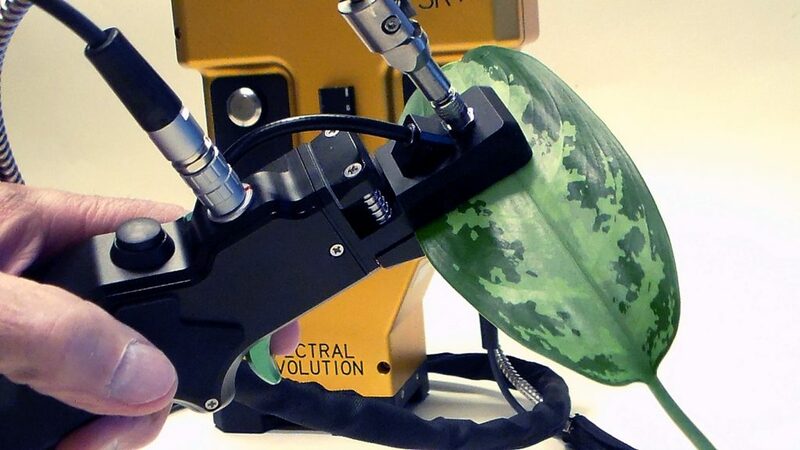 PSR+ with our uniquely designed leaf clip for vegetation measurements.